My American Confessions: Tuesday: How to Use Aluminum Foil- in 10 Different, Handy Ways! Tuesday: How to Use Aluminum Foil- in 10 Different, Handy Ways! I'll bet you never knew that the few bucks you spent on your aluminum foil would end up doing much more than wrapping potatoes in the oven. 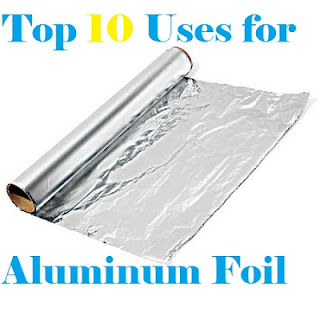 Read this fun list and you'll learn what a truly handy tool aluminum foil can be! 1. 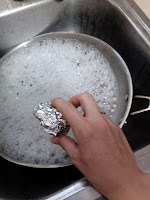 Polish Your Tarnished Silver If you don't feel the urge to rub polish all over your tarnished silver, use aluminum foil for an ion exchange! Line a pan with aluminum foil, fill it with cold water and a tablespoon of salt. Then, drop your tarnished silver into the solution. Allow it to sit for a few minutes, then rinse and dry. Easy-Cheesy! 2. Scrub Your Pans Missing a metal scrubber in your kitchen? Skip the run to the store and crumple up a piece of aluminum foil instead to become your pot scrubber! 3. Soften Brown Sugar I love this tip. Wrap your dried out brown sugar in a piece of aluminum foil, put it in the oven for five minutes at 350. Wallah! Soft like new! 5. Wait. MORE Protection in Painting When pulling out your painting equipment, line the paint pan with a sheet of foil and YOU won’t have to waste about one million gallons of water trying to rinse it clean for future uses! 6. Dryer Sheet This is another surprising use. (just get used to the surprising uses of foil!) Crumple up a few inches of foil and throw it into your dryer when you dry your clothes. It works to fight static cling! 7. Makeshift Funnel If you ever find yourself in need of a funnel but don’t have one handy, simply mold one with aluminum foil to transfer your liquids from one container to another and you're good to go! Covered, hole punched, muffin cup! 8. Muffin Tin Liner Do you find that you hate scrubbing out your muffin tins? Wait- so do I! 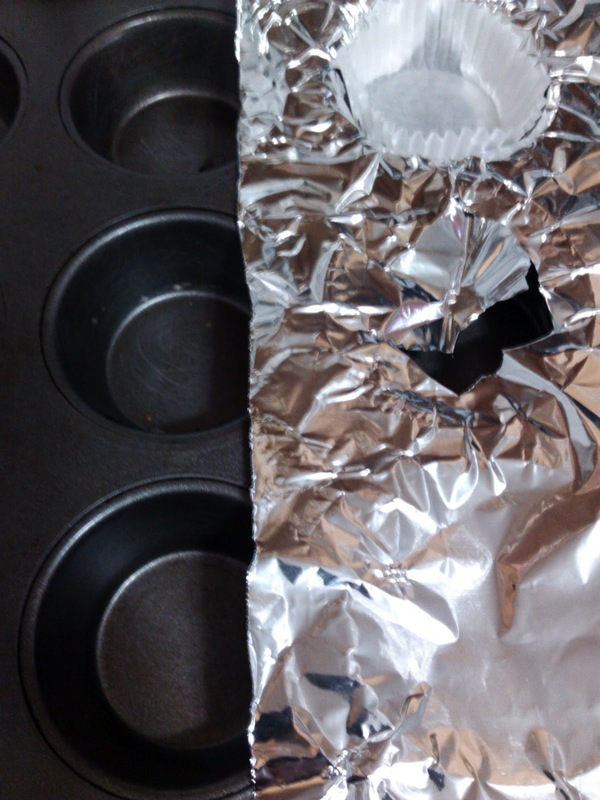 To prevent the scrubbing BEFORE you make muffins, simply cover the top of your muffin tin in foil, punch holes where your muffins go, and put your muffin cups into their usual places. 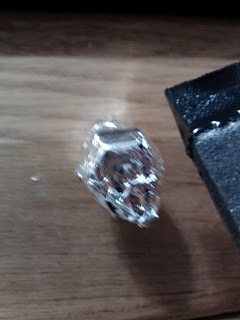 Then, as you get drips and drops on your pan, you know that clean-up will be as easy as crumpling aluminum foil! 9. Clean Your Iron You’ve been ironing a lot- good job! But now the bottom of your iron is so gross that you think you might need a new one! Clean it up by running your hot iron over a piece of aluminum. Boom. Done. 10. (most fun) Cooking in Your Engine You might have heard of it before and dismissed it- the idea may seem so foreign. But, using aluminum foil, some wire, and your car, countless dishes can be created while you drive! Don’t worry- these packets of food, triple wrapped in heavy duty foil, contain no odd flavors or dangerous effects from your car engine. Think, if you will, about a dirty oven. Covered in spills, burned on for who knows how long, wrap a potato in foil to bake it and there will be no adverse problems with your potato. It’s fun to do! Interested? Check out “Manifold Destiny”, by Chris Maynard and Bill Scheller, who have concocted a whole book full of recipes to be cooked in your engine while driving and, rather than cooking in minutes or hours, times their recipes with miles driven. I’ll be putting together a list of my own engine delights next week- so check back for exciting adventures!